Focus on the present. You can’t return to the past, or control the future, so do what you can each day. That doesn’t mean neglecting a long term strategy or to avoid hopefulness, but it does mean to take things as they come. Celebrate the little victories and what remains familiar and beloved. Each day is a new beginning, both in terms of daily routine and in opportunities to connect and grow together in new ways. By focusing on the present you focus on what you can control moment to moment, from managing medications to having a symptom-free day to appreciating small joys like seeing a grandparent enjoy the littlest members of the family. Ask for help if you need it. Just as your loved one needs help, so do you. 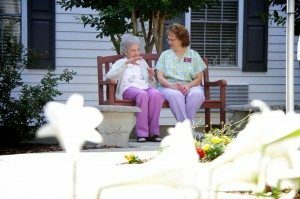 Delegate where you can, whether by seeking out a personal care residence, an in-home nurse, or simply scheduling time for yourself or confiding in friends, a therapist, or a trusted religious advisor. You simply won’t be as effective a caregiver if you are depressed, anxious, overwhelmed or burnt out, so practice self-care. Plan ahead. By taking care of legal and medical decisions ahead of time, you will not only have your paperwork squared away and a plan, you will also be more emotionally prepared for what comes. It is inevitably difficult and sad to face the future passing of a loved one, and caregiving can cause you to confront that reality. But by planning ahead logistically, you can also look ahead toward the emotional hurdles you will face. While nothing can ever completely prepare you for a loss, you may be less blindsided than if you did not do some practical homework and mental processing well ahead of time. Through the ups and downs of caregiving, focus on the compassion, empathy and love that motivate you. You’ll find your confidence as a caretaker growing, and that your relationship with your loved one, however changed, can grow in new ways.